A short guide to help get you started building your first boat. Getting into a new hobby or developing a new skill set can be both exhilarating and intimidating. You can get easily overwhelmed by the influx of new information. Connecting the dots from one concept to another can be challenging. I quite clearly remember a day when I first contemplated getting into boatbuilding. I was at a small wooden boat show and as I looked down at a shiny ribbed cedar canoe, I tried to contemplate just how I would begin the process of learning this new discipline. I procrastinated far longer than I should have, but eventually I took action. This was before the Internet was at our fingertips, and the offerings at my local library presented little guidance, but I did find one how-to book that looked promising. It walked me through building a craft that was far from my dream boat but was an easily digestible project that got me started on a bootstrap budget. Whether you are just wanting to build one boat to goof around in or build yourself a new career, this little guide is to help you take action. It does not contain all the answers, but is intended to function like a checklist, identifying the next step toward your goal. This will streamline the process of decision-making and I hope prove educational and engaging as well. Start with some generalized reading. You’re not looking for a specific design, just familiarizing yourself with the broad spectrum of methods and concerns. It will help you to make more informed decisions later on and generate ideas. Creativity plays a large role, no matter how detailed a set of plans, and you need to feed that creativity. Wooden Boat Magazine is a great place to start. Pick up a copy, sit back and read. Make a wish list of the things you would like in your first boat. You will have to prioritize this list, so rank the items on a scale of 1-3. Consider storage of the boat, transportation, capacity, appearance, primary propulsion, intended conditions of use and budget. How much time can you dedicate to the building process on a consistent basis? Lastly, make a critical assessment of your skill level. General carpentry skills are transferable, as are artistic and engineering skills. Your skills will develop as you move through the project, but keep your sights within reason for now. With your wish list in hand, begin to explore available designs. I recommend you pay attention to the designers’ names and when you find something that catches your eye, regardless of whether it is the type of boat you are interested in, contact that designer directly, and using your wish list, explain what you are looking for. Many designers may have some early simple designs they no longer bother marketing that could fit your needs. They may suggest the work of a different designer that you have not heard of. Try to find two or three designs that best match your wish list and get some study plans of them. Take some time to absorb those plans and try to imagine the steps, tools and materials required to build each of them. In the next step, we start to get our hands a little dirty. With your two or three study plans in hand, choose the one that you think is the best choice or at least appeals to you the most. We’re going to try building a simple model of this boat. There are different options here. If the design is a flat-bottomed boat or something with just a few wide panel planks, I suggest you try a cardboard model. Model aircraft plywood, balsa wood or styrene plastic sheets are also good choices. If your boat is something that is very round-bottomed, a solid half-hull model built of softwood may be a better choice. Modelling clay or high-density styrofoam insulation can even be employed. This is how cars are taken from drawing board to 3D. Build your solid model at a minimum of 1/8 scale (1/4 might be even better for the cardboard version). This is a good way to get a better sense of the complexity of the form you are interested in. It will also get you thinking about work space and tools. If your workspace is very small, maybe build a scale mock-up of that too. Models can be challenging, so take your time. It doesn’t need to be pretty or involve all the little details, just give you a better sense of the form. Make a paper person to the same scale and pose them in or around the model to judge size and proportion. If done accurately, this model can help you solve problems and make decisions later in the building process. While I don’t always start with building a model for every boat, I often build one part way through the full-size construction process as a problem-solving tool. If your first design choice proves to be too difficult for you to build a model, chances are the full-sized boat will present the same or greater obstacles. Perhaps you should look at the next best design you selected and try that. You may have to re-think your wish list and choose a simpler design. Even the simplest boats can be fun and challenging to build and, with the right attention to detail, have elegant results. Once you have settled on a design, obtain a set of complete plans. If there is any support material available, such as how-to publications for that particular design, it is probably a worthwhile investment as well. Even an experienced builder can learn from another person’s approach. Take some time to study the plans and try to imagine the building process. Make notes of areas of concern. Go over your boat plans in detail and make a shopping list. Work out the type and quantity of fasteners you’ll need. Always buy about 20% extra, as you will always miss something. With some types of fasteners, such as stainless steel screws or bronze ring nails, it is cheaper to buy a box of them rather than to buy a smaller quantity from a bin. When estimating wood requirements, remember that most wood will be purchased rough-sawn in thicknesses of 1″ or 2″ and have full dimension and random widths. Beyond about 12-14’ in length, it is probably more practical to scarf material to create full-length stock than to source full-length stock. Specialty hardware may be challenging to find, so start looking early. You may have to fabricate some yourself. If you are going to require plywood, it will only come in 4′ x 8′ sheets. Many older publications specify 10′ – 20′ long sheets. These products are no longer available. While you can find suppliers who will scarf longer sheets for you, it is much more economical to do it yourself. It is not difficult. Don’t forget finishes and abrasives, solvent, rags, safety supplies etc. Lastly, a few 2x4’s, assorted fasteners and such come in handy for unforeseen situations. I am often cobbling together jigs and furnishings to get a particular job done easier. Will it have a sail rig? Make sure you talk to a sail maker about costs and options. It is best to have the sails on hand before building the rig. How about oars? Are you going to buy them or build them? Do you have the basic tools required to build this specific design? Do you have the space? This might be a good time to do that ruthless garage cleanout you’ve put off. Less is more in an efficient work space, so start with making elbow room and build a simple but sturdy and stable workbench. I find that the best bench is two feet deep, 32″-36″ high and the full length of your boat with a plywood top. Do you have the clamps you will require? Buy, borrow or build them is the name of the game here. There is always a workaround using screws and scrap if you don’t mind filling a few small holes. If you are unsure of what you will need, try finding a how-to book on building a boat that incorporates the same or similar construction technique. You will likely find tool and equipment suggestions there. Large machines are not always mandatory. Much of the heavy work can be accomplished with hand held and contractor sized power tools. You’ll want a few high-quality edged hand tools as well as saws, chisels and planes. This is one area where you get what you pay for. Quality tools last several lifetimes and can always be sold at a good price. The first tool item to consider should be sharpening. Edge tools play a big role in the boatbuilding process. Do some research into sharpening techniques and choose one that suits your budget. High-quality stones can get pricey, but you can get by just fine with wet/dry sandpaper on a plate-glass backing. If you feel a sharpening aid is necessary, choose a good one. With shopping list in hand, go looking for suppliers. Your local building materials supplier could help you source some materials and letting them know that you are building your first boat could interest them and garner some goodwill. If there is a professional boatbuilder in your area, ask if they can supply you with the materials you need. They may be willing to take care of milling needs that you are ill-equipped for. If there is a sawyer close by, that may be your best bet for boat-quality wood, but it will be cut green, so you need to factor in drying time. 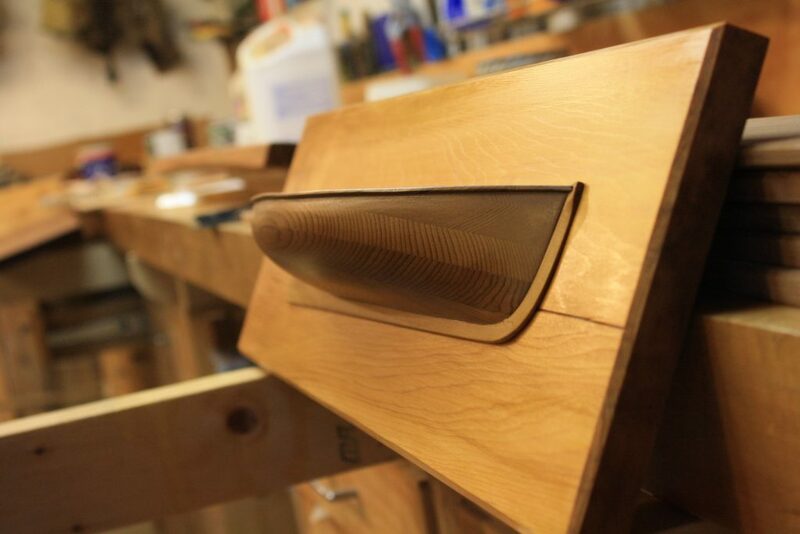 Six months to a year of drying time may be required unless the wood is to be steam bent. With the workshop set up and some materials on hand, it is time to get to work. I like to get as much basic milling out of the way as possible so I can pick dressed materials off the wood rack as I need them without having to drag out heavy machines. Sometimes parts require larger dimensions than are listed on a construction drawing because of bevelling or shape requirements. Concentrate on the materials that you can easily visualize. Some items are best dealt with once the project is underway. Once you set up your building mould, your shop space will become much more difficult to move around in, so think about which projects would benefit from more elbow room. If you plan on building oars or spars, I suggest you tackle them first. They are a good warm-up exercise and it is really nice to have them done when the hull is done and then the finishing can progress on both. There are probably a few parts moulds or patterns to develop, so tackle these as well. There is also the strongback and station moulds to fabricate. In most cases, I recommend common 1x6 or 1x8 for station moulds rather than plywood. it requires some simple joinery, but is much easier to shape and you can double up pieces to cut mirror images. They will also survive lying around in the backyard as you contemplate building another one and burn much better than plywood when you realize you want to build something else instead. With smaller parts out of the way, it is time to set up your building jig or mould. Take your time to set it up accurately. The strong back should be level in both directions. One trick is to balance it on top of a sawhorse at an appropriate height. Level it from side to side with some wedges or shims. Next, clamp a 2x4 onto each end as a temporary leg, to level it fore and aft. Check the side-to-side level at the ends to avoid a twist in the strongback. Now you can screw legs to each corner and a few near the midship area. Diagonally brace them all well. Fasten them to the floor with some angle brackets. Now run a taut, small diameter string line down the middle to align your station moulds to. Set up your station moulds starting at the center. Brace the midship mould to the strongback to hold it plumb and then brace all the other stations to the midship mould with a stiff batten. Double-check all your work. You are ready to start creating your first boat. 1. Keep a timesheet and diary. You may decide to build the same boat again and this information can be a valuable resource. Even if you build a different boat next time, there may be some useful information to draw upon. Take plenty of photos as you work, especially details. Play with your camera to find the best setting for the light conditions. Flashes often wash out a lot of details, so try to avoid using them. If you have a tripod, put it to use. 2. Set small benchmarks for each day of construction. It will help maintain a pace and a sense of productivity as you meet these goals. Everything will take longer than you think, so don’t be overly ambitious. 3. Always do trial clamp-ups before using any adhesive. You don’t want to be running around looking for necessary clamps after glue is starting to set. Remember to have the appropriate clean-up materials on hand as well. 4. Don’t take shortcuts. They often backfire. Good work takes time. Mistakes take more time to fix than to avoid. 5. At the end of each day, try to sweep up a bit and put away 10 tools or items. It will help keep clutter from consuming your workspace. 6. When you run into a problem, avoid getting upset. Plop down into your groaning chair (a vital piece of boat-shop equipment), have a coffee or a beer and think the problem through. Do a little reading or try posting the problem on a boatbuilding forum. If you have found a professional boatbuilder who is willing to offer advice, give them a call or even hire them to help you for a couple of hours. You can learn a lot in a short time. 7. If you don’t have much time to work on the boat, use what time you do have to sharpen some tools or tidy up. Every project has loads of tiny details and this might be a good time to tackle just one or two. 8. Try to involve friends and family in the building process if they are interested. Perhaps there is a young person in the neighbourhood who would benefit from involvement. You may find that an extra set of willing hands keeps you on schedule and saves you some stress. I press my neighbours into service on a regular basis and they are always happy to help out. 9. Do a good job but don’t sweat the small stuff. This is about having fun, not developing a stomach ulcer. Does it look pretty good from ten feet away? Good enough. Favour paint over varnish and favour oil over paint. It doesn’t have to be pretty to be fun. Get the boat done before you are too old to use it. 10. Lastly, try to get a lot of use out of your finished product. Don’t baby it too much. The wear and tear will help inform your decisions on the next project. Did you build too heavy? Did you build too light? How would you improve your results next time? A well-known designer I know keep performance notes on all his new builds and he is one of the few who will rework his designs after a few years of input. Finally, don’t procrastinate like I did!